We’ve been excited for the High Hemp Blazin’ Cherry Wraps ever since we heard rumors they were coming. Now it’s official, and Hemp Wraps got our hands on a pack of High Hemp Blazin’ Cherry Wraps before they were released so we could give you a review before you make a decision to purchase. You want to know how it rolled, smoked, and tasted, correct? 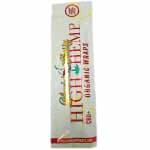 As with other High Hemp Wraps, the packaging includes a freshness seal. The design is also very similar, except these wraps display a cherry in the middle of Blazin’ Cherry. Each pack includes 2 wraps, 2 tips, and is Vegan-approved! We’ll be honest, we were expecting this hemp wrap to taste like cherry cough syrup, but we were wrong. The wrap is somewhat flavorless, but the aroma is there. We were surprised to smell cherry and to simultaneously have all the flavor of our herb. Upon opening the packaging, we immediately smelled a somewhat alcohol-cherry scent. It kind of smells like cherry alcohol rub. Once we had the wraps in hand the smell faded. It was just right, not overwhelming, and simply cherry-ish. The hemp wraps we tried weren’t too dry or too moist. They’re consistent with the feel of a blunt wrap or really thick rolling paper. They roll pretty nicely. There was no cracking or breaking while rolling with this hemp wrap. Have some saliva ready because the wrap tended to burn unevenly, but not horribly. It’s also not the slowest or best burning wrap we’ve come across. The burn, however, is acceptable and not annoying. High Hemp hasn’t released the price yet. When they do, we will be sure to update you. Expect this flavor to be the same price as other High Hemp Wraps. You will buy these around $3 for 2 wraps, which is reasonable for those that demand a high quality hemp wrap. See our Original Comments on “CBD Positive” statements made by High Hemp.